Sandal season left me with cracked, hard heels and although I'm well aware that exfoliating my feet would prevent this, I'm guilty of neglect. I've tried multiple foot care products such as pumice stones, creams, foot files and the Ped Egg. But foot care is a chore and foot filing in particular is labour intensive and has never really left me with super soft feet, just a sore arm! 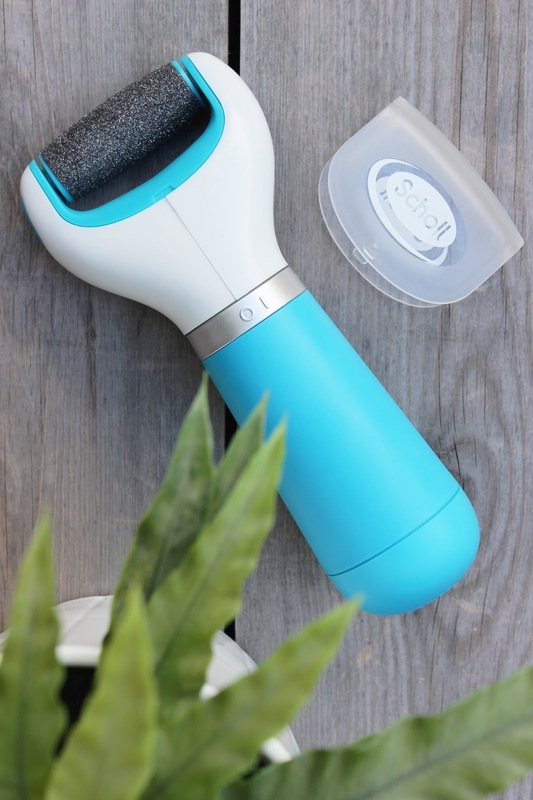 However, the Express Pedi requires minimal effort and in short is a relatively simple device, with a pumice stone style circular bar, which rotates and works through the hardest of skins. It's a given that it's heavier than a foot file, but the battery powered device fits nicely and comfortably in the palm of my hand. To operate you simply switch on and slide over the hard parts of your feet until the dead skin disappears in a puff of skin smoke. Pressing too hard stops the rotation of the roller head, but I presume this is a safety cut so you can't damage your feet. Having said that, it is advised not to use in the same area for more than 3-4 seconds at a time. And no it doesn't hurt. It's painless. In fact, I find the whole process weirdly therapeutic! So what sets the Scholl Velvet Smooth Diamond Pedi apart from other electronic foot files? Well, not only is it a miracle worker, the roller head with long lasting micro-abrasive particles now comes with finely ground diamond crystals making it even more abrasive and long lasting. The roller heads can be easily removed and rinsed and are available in soft touch, regular and extra coarse. Another big plus is the gap between the device and the roller head, an odd point maybe, but this allows the skin smoke to fall rather than clog up the device a feature other electronic foot files do not carry. The results? Well I no longer shudder every time I get into bed and feel patches of dry skin catch on my sheets (just shuddering at the thought!). I'm now the Queen of smooth soles and incredibly happy with the results. In fact, I've already purchased replacement roller heads (back up beauty and all that jazz). And for the price of two pedicure sessions, it's well worth every penny. It's by far the best foot care product I've tried - you could say I'm head over heels! You can buy it online here at Argos for £23.99.